IMPORTANT: Our rates are all included, no hidden costs!!! No supplement for final cleaning and/or bed linen and NO extra charge per person per night above 2 people. Paid car parking is applicable everywhere in the city center of Bruges. Maximum parking duration in the city center is 4 hours! Paid parking in the inner center applies every day, also on Sundays and public holidays. Underground car parks can be fully occupied in season. If you book with us and if you are coming by car, you can be confident to have free parking for your car! The penthouse apartment is situated right in the heart of Bruges, this attractive penthouse-apartment, measuring 110 m² (1183 square feet) with private roof garden, comes with a charming and chic décor as is shown on the photos. The apartment is split over two levels. First floor: A French door opens from the salon/kitchen into a private roof garden with barbecue, where you may dine and relax in summer the whole day long. There is a fully fitted kitchenette with a full array of cookware, you can shop at the local market and prepare your own gourmet meals. Adjoining the salon is a dining table for five persons. The cozy lounge has an extremely comfortable double sofabed (Ligne Roset) and a view out on to the street, with its selection of books, CD’s and DVD's it is the ideal place to relax after a busy day sightseeing. Second floor: The luxuriously furnished master bedroom in favour of a king-size bed with its own colour TV, a bathroom with washing machine, shower, vanity unit, and water closet (WC). Next door there is a second small single bedroom and vanity room. 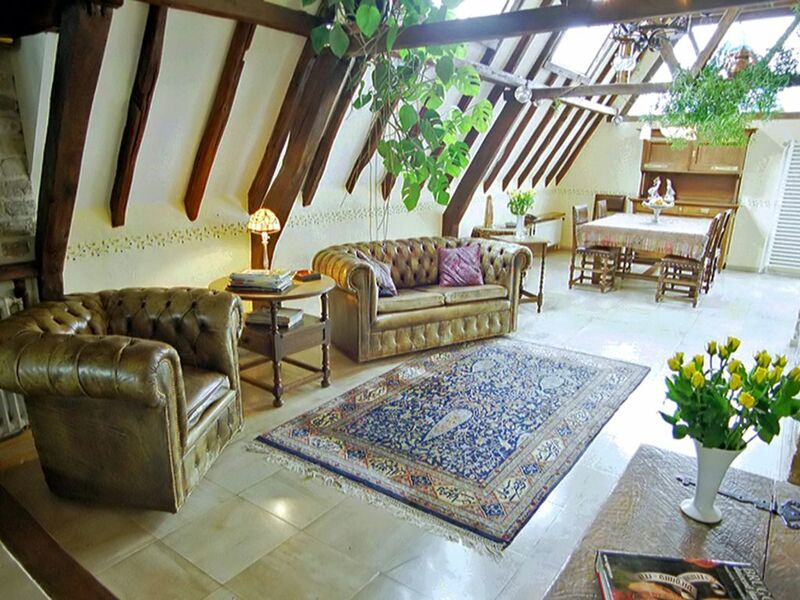 This four-star apartment, right in the heart of the old and historic Bruges, is ideal if you are going for a full immersion of Flanders culture. The famous Belfry tower on Bruges’ Main Square and the Burg Square with the City Hall and the Basilica are both in the same neighborhood. Not only well located for arts and culture, but also in the gastronomically point of view it is well situated. There is a varied choice in restaurants and tea houses where you find our irresistible Belgian Waffles and Chocolates. The fully-equipped kitchenette has everything you need to make your own home-cooked meals, including a microwave, coffee-maker, vitro-ceramic heaters and refrigerator, toaster, complete set of cookery utensils, and pots and pans. Cable TV in both, living room and master bedroom, with a wide range of stations including CNN, BBC1 and BBC2. Hair dryer, iron and ironing table at your disposal. Beds are made up before arrival. Extra towels are available on request free of charge. The apartment has its own private entrance. We leave lots of guidebooks of Bruges, Brussels, Flanders... for you to peruse during your stay. An 18-hole golf course is just five mile away. (Damme). Other historical cities within easy touring distance, by car or by train: Brussels 98 km, Gent; 45km, Ieper; 50km, Ostend; 25km, and the Beach; 20km. Everything is included, no hidden costs! Our rental prices include all utilities, electricity, heating, hot and cold water, residential taxes, local calls, use of linens and towels and final cleaning. Reservations: If you would like to reserve the penthouse apartment, please e-mail us. We will get back to you promptly. Don't hesitate to ask questions! Our goal is to give people the opportunity to have a fabulous stay in Bruges, so that when leaving they already know that they will come back to Bruges and the apartment time and time again. Read what our guests have to say about staying at the Penthouse, please click the link on the right side of the master bedroom photo. The more information you get, the more you will enjoy our apartment and our city. Once we have agreed on the apartment and reservation dates, we will mail you our booking form, a confirmation of rental amount and deposit instructions. Sign the booking form and email/fax it back to us. In order to secure your reservation, we require a deposit of €100. Payment is requested by bank deposit, credit card or Paypal. On receipt of the deposit, we will send you a complete information packet, which explains arrival details, keys, etc. Final payment is made on arrival. The apartment will be thoroughly clean when you arrive. About Bruges: Bruges is a medieval city of beauty and charm, with canals and waterways meandering their way through rich heritage and architecture, this romantic city is a must. Don't forget to be tempted by the delicious chocolate and famous Belgian beer! Enjoy the historic buildings and the magnificent Market Square, with the imposing Belfry tower, and its breathtaking panoramic view over the city. Admire the Burg Square, visit the 14th century City Hall, the Lake of Love and the Beguinage. All these are just some of the charming sights that make Bruges such a delightful and unique city. Exquisite lace and delicious hand-made chocolates can be found everywhere in Bruges. At weekends you can browse for antiques at the flea market along the canal. Spoil yourself with gastronomic delights, sit and relax in the terrace cafés with a cool glass of the world famous Belgian beer, eat delicious waffles, but most importantly, don't miss out on the famous chips with mayonnaise! Thanks to its favorable location, Bruges and the penthouse apartment can easily be reached by car, train, schip and plain. Ghent is at 30 minutes by car, International airport of Brussels at 1 hour, Amsterdam at 155 mile and Paris at 173 mile. Bruges, on the important railway line London-Brussels, is accessible by direct trains from various European cities. Only one transfer is necessary when coming by train from Amsterdam, London, Rotterdam, Luxembourg, Milan, Bologna, Rome, Rimini, and many other cities. Free parking is provided! Paid car parking is applicable everywhere in the city center of Bruges from 9.00 a.m. to 8.00 p.m. Maximum parking duration in the city center is 4 hours! Paid parking in the inner center applies every day, also on Sundays and public holidays. Underground car parks can be fully occupied in season. We offer free parking for your car in a nearby private garage at 100 metres further down the apartment If you book with us and if you are coming by car, you can be confident to have free parking for your car! Free parking is provided! Parking is available at 100 meters further down the apartment, you can park your car in a private garage with a special access card that we offer for free. Private Roof Garden, Charcoal Grill (BBQ) Free broadband access to internet and computer available at the Penthouse Apartment, all free of costs Free parking is provided! Parking is available at 300 meters further down the apartment, you can park your car in our private garage with a special access card that we offer for free. Bruges is a compact city. Most places of interest are within walking distance of our accommodation. In order to keep the historic city centre attractive and accessible, aboveground parking in the city centre is limited to a maximum of 4 hours in the Blue Zone and to 2 hours in the Pay&Display Zones. Underground car parks can be fully occupied in season. If you book with us and if you are coming by car, you can be confident to have parking for your car! Right in the centre of brugges, in a beautiful old building. Marc and his wife were wonderful hosts, and so kind. We would definitely stay again.